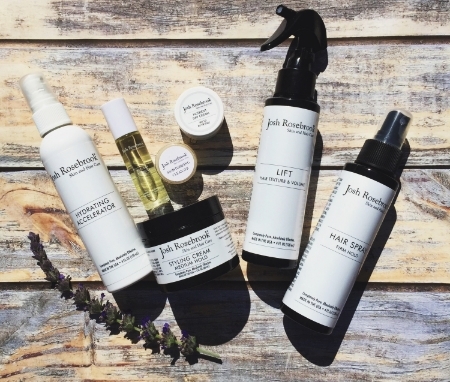 Josh Rosebrook: Product Review, Q&A with Josh & BIG GIVEAWAY — janny: organically. Anyone who has followed me for a while knows I've been trying a variety of organic, non-toxic and chemical-free hair products in search of at least one that actually works well! I've come up empty handed for quite some time but I'm happy to report that my search is officially over. Make-up can be fun to experiment with even after you find your favorites, but skin care can be another story, and for me, hair is a big one. Once I find a line that meets all my requirements and delivers superior results I shut down the search party. Hopefully you can too. The ingredients in all Josh's products are completely pure, organic, certified organic or wild crafted. They are a unique combination of active plant ingredients and absolutely toxic-free. Over the past month or so, I've been able to test out several of Josh's skin and hair products and I haven't been able to keep quiet about them. I'm practically placing orders for my friends and family, which is why this line gets its own blog post and a big time giveaway of which there will be TWO winners! But first, a little overview of the botanicals in a bottle kept in my own cabinet. I kind of own them all. A delicious-smelling, antioxidant-boasting, power product. You don't need to use too much - just a little will eliminate all the dirt, bacteria and oils from your skin. It has a very light foam and leaves your skin feeling soft and balanced. Oh my heart, this is a favorite for sure. I spray it on my face after cleansing to drench my face in vitamin-structured water molecules which reduce the skin's surface tension while hydrating and nourishing. With my face is still damp from the Accelerator, I apply Josh's Deep Hydrating Serum (see below). The Accelerator delivers its own benefits while also acting as the vehicle to deliver the nutrients from the moisturizers/treatments and trapping in all the good stuff! Not to mention, it smells like cream soda. I don't partake in sodas these days, but I'd be lying if it didn't take me back to my childhood and tempt me to open my mouth as I sprayed. Do I like to eat and drink all my beauty products? Basically! I can't get enough of this serum. It smells SO amazing, I asked Josh for a perfume version of this scent! This delicious blend also diminishes age lines, neutralizes free radicals, smooths, brightens and boots your skin tone, repairs skin damage and imperfections, accelerates skin cell turn-over, firms skin structure and restores elasticity, moisturizes deep into the layers of skin, calms and heals dry and problem skin....man oh man...so much more, just get it, trust me. If you are on the fence about it - this is the ONE thing I would encourage you to splurge on. Hmm. Well, maybe this is my favorite? Not only does it deliver superior moisture while providing SPF 30 protection, it also contains non-nano zinc oxide (which is THEE best ingredient for sunscreen). It absorbs completely into the skin without leaving any white residue on the surface. And yes, this one smells incredible too. Since the skin around the eyes is thinner and more delicate than the rest of the face, Josh has developed a specific oil-based eye treatment to properly nourish this area. Recently, we've been having some late nights with the kiddo, and this formula even helps alleviate the puffiness and dark circles right away. I have also been rolling this bad boy down one particular deep wrinkle between my eyebrows (I'm a furrower) and even though this isn't necessarily the target area, I've seen a drastic improvement in that perma-wrinkle! For some reason, the smell reminds me of a glass of wine even though there isn't a trace of alcohol in it! The product that started it all! Great things come in small packages! The antioxidants delivered in this mask stimulates blood flow and the vitamin, mineral, amino and fatty acid line-up work together to feeds your skin in a powerful way. You'll see immediate results with tighter, detoxified skin...keep using to witness a total complexion change for the better; clearer, brighter and firmer. And fess up, who wouldn't want to put the purest form of chocolate on their face? Quick and simple: It adds texture and light volume to hair like mine that has no life at the scalp. I can't over-complicate this one, it works wonders for me! I don't use hair-spray often at all, but I wanted to have on hand for when I start styling my daughter's hair in braids and do's. With her fine hair, I wanted a non-toxic way to hold a style. I used on my hair a couple of times to test, and again, I'm not going to over-complicate it - it gives a firm hold like the competing brands, without all the chemicals. I just got my loot yesterday and was smelling them all day until I could use them. Of course, they are ultra-moisturizing and protecting bringing out such a natural, healthy shine and soft texture. I'm excited to add these to our shower caddy! janny: organically. : Josh, I'm head over heels for your product! I want to get the word out about your line, so I thought we could discuss the line and your approach for the first-timers. Josh: Absolutely! And thank, you, you have been so supportive! JO: You bet! Ok I would consider myself 'herb-savvy' but I read all your ingredient labels to found out there are so many more that I've never heard of, like Slippery Elm, Chickweed and Skullcap to name a few. How did you go about choosing the ingredients for your products? Josh Rosebrook: What I've come to know after years of working with an herbalist is that herbs are all so potent and we've chosen specific herbs that work really well with the skin and the scalp. Most herbs have powerful anti-inflammatory, antioxidant and antimicrobial properties as well as vitamins and minerals. We've chosen specific ones so when paired together the results are exponential. That is what refer to as synergy and what makes my products truly effective. JO: Do you have a favorite? JR: They are all so amazing. Whether it's fennel seed or chickweed or dozens of others, they are powerhouses and contain incredible phytonutrients. They are all anti-inflammatory, they are all, to some degree, anti-bacterial and antimicrobial and then some have more antioxidants or more Vitamin A or Vitamin C and so you can't pick just one. There is a lot of development going into my formulations, part science and part intuition. JO: What would your recommendation be for hormonal, acne-prone and/or scarred skin? JR: Off the top of my head, aloe vera gel and raw honey applied to scars is really helpful but you have to be diligent about constantly reapplying it. Many oils help reduce scarring: Jojoba, Hemp, Almond, Coconut, Rose Hip, the list goes on and on. For hormone balancing I recommend Clary Sage and Burdock. My approach to the skin has to do with anti inflammatories and antioxidants. I see the skin as an organ that knows how to heal itself completely. So what we need to do is calm the skin so that its natural healing ability can be reignited and begin healing. Then we facilitate and support it with the natural ingredients and vitamins. The antioxidants work to calm and neutralize the free radicals - because free-radicals attack collagen production. So when you add in antioxidants, your skin can produce more collagen and elastin - and that's the structure of the skin. Then the vitamins and trace minerals are feeding the cells the nutrients they need. It's a holistic approach. You're never going to find me marketing one singular ingredient as "the way." Yes, Marshmallow Root, Argan Oil, Marula Oil, Neem - they are all amazing and getting a lot of attention right now, but I'm not going to take one extract and exploit it. I've found its when you take specific herbs and pair them together, that's when the results are exponentially incredible. JO: Yes! I love it and agree! OK, so can we expect new and exciting products soon? JR: Yes! So I've got my Nutrient Day Cream Tinted coming. It gives a nice color glow with a mineral tint, self-adjusts and brightens! It'll be available in a 1 oz size next month. I also have an Herbal Infusion Oil coming out which is an multi-action product for cleansing, make-up removal and treatment serum. It takes off make-up with one swipe, no stinging, no irritation while cleansing and treating! Its a combination of grapeseed oils, almond oils, sunflower oil and herbal infusion creating a perfect texture and consistency. Then I'm adding two Shampoos this summer: One for Weak and Fine hair with a Conditioner to match, the other for Dry, Damaged and Coarse Hair paired with a Conditioning Hair Mask. JO: Wow, you've got a lot of fun stuff coming! You just got a lot of people very excited! JR: Yes, I've got a lot of work to do! JR: Aww well I've put down my sheers! I'll probably pick them up again later, but I've put them down for now because I have products to develop and share! JO: Alright, final Question. NSYNC or Backstreet Boys? JR: Backstreet all the way. JR: Backstreet boys. Black and Blue. JO: I'm an NSYNC'er for life. I'm glad I didn't start with that question. JO: Thank you so much for taking the time to talk to me! JR: Thank you, I'm honored. You can find Josh's line on his website or via The Detox Market. His products are becoming more popular every day so don't be surprised if one place is sold out of a particular product or two! Josh offering a few of his products as to two lucky readers. Good luck and happy Rosebrooking!